Ever heard of Aguas Frescas? It's Spanish and literally means 'fresh waters'. It's made from fruit, herbs, flowers, water and sugar. I don't add sugar because fruit has plenty of sugar in and of itself. It's a great summer drink and a healthy way to stay hydrated. I'm not 100% sure where this recipe came from. I think it came from experimenting and I'm so glad I somehow threw these ingredients together. 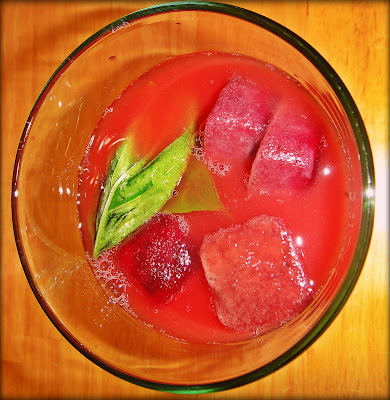 -Take the berry juice and pour it into an ice cube tray and pop it in the freezer. I used my Breville juicer, made some fresh blueberry juice and froze it. -Cut the watermelon into large pieces. -Put 1 C. water into a blender, add some watermelon pieces and blend. -Once it is blended strain the watermelon water. -Repeat the blending and straining process until your pitcher (or two) is full. 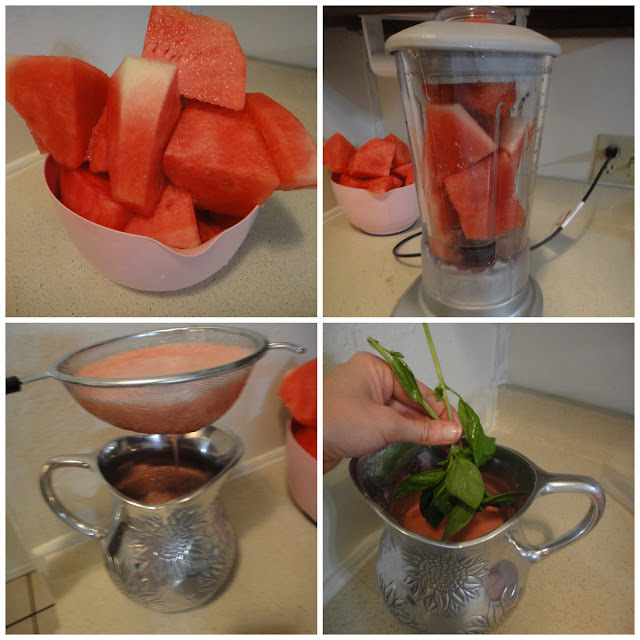 -Take a large bunch of the basil and place it into the pitcher of watermelon juice. Let this sit over night or at least 8 hours. -Get those ice cubes out and pour yourself a nice glass of watermelon water, squeeze in half of a lime and enjoy. So delicious! I've heard mint aguas frescas is good too! I'm hoping to try that soon. I'd love to get some new recipes like this so if you have any send 'em my way.